In a bold effort to restore consumer confidence in Gulf of Mexico seafood, EDF is working with a group of forward-looking Gulf fishermen and other conservation and fishery improvement organizations to launch a new seafood assurance campaign called Gulf Wild™. The Gulf of Mexico Reef Fish Shareholders’ Alliance, a trade organization of fishermen in the individual fishing quota (IFQ) catch share program for Gulf red snapper and grouper, developed Gulf Wild™ in collaboration with EDF to help consumers, chefs, and retailers identify responsibly managed, safety-inspected, authentic Gulf seafood that can be tracked directly to its source. Gulf Wild™ fish labeled with a sequentially numbered gill tag, which is trackable on mygulfwild.com. Gulf Wild™ requires participating fishermen to verify that the fish were caught in a sustainable manner under a unique set of “Conservation Covenants”, which guarantee conscientious harvesting. Additionally, Gulf Wild™ fishermen have already been operating under a red snapper IFQ program since 2007 to better manage the fishery. 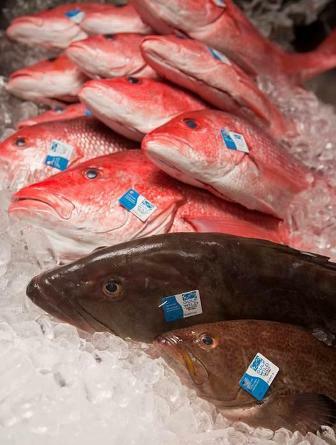 With that IFQ in place, Krebs said, “Gulf red snapper is moving from a ‘red-listed’ fishery to a more sustainable one.” Since the inception of the red snapper IFQ, overfishing has ended, wasteful discards have dropped by 80%, and fishermen have seen a 40 percent increase in the total allowable catch. Key to the Gulf Wild™ program is a tracking system that allows the buyer to “find my fish.” Each Gulf Wild™ fish is marked with a sequentially numbered gill tag just minutes after it is brought on board, whose unique credentials are uploaded to the web when the catch reaches shore. That information is made public via myGulfWild.com, where you can enter the unique tag number and confirm the fish species, catch location, landing port, and even information about the vessel and its captain. Finally, in direct response to consumer concerns stemming from the BP oil disaster, Gulf Wild™ incorporates a stringent safety-testing protocol that goes above and beyond federal requirements. An independent international testing laboratory will routinely sample Gulf Wild™ fish to test for oil-based contaminants such as PAHs, dispersants, and heavy metals. To start, Gulf Wild™ tags are now on Gulf red snapper and grouper, with more than a dozen species from the IFQ catch share program to follow. We will continue to expand and improve upon Gulf Wild™ in the months to come, in partnership with an advisory panel of respected experts from the culinary, food safety, public health, conservation, and seafood marketing communities. I am excited about the Gulf Wild™ project for a number of reasons. First, it highlights the efforts of a rebounding fishery that has transitioned to more sensible management and made notable environmental and economic gains as a result. Second, it shows that there are success stories to be told in the wake of last summer’s BP oil disaster. Last, but not least, Gulf Wild™ can serve as a model for other fisheries around the country as a way of building consumer confidence while creating new market value at the same time.